Fit: Semi-Fitted: Designed for 3 to 4 inches of ease between body and garment. Measures 3 to 4 inches larger than the fit-critical body measurement. Somewhat close to the body, but cut for ease of movement and fabric drape. I love these pants. They are very comfortable to work in and stylish. I get a lot of compliments when I wear them. I have them in red and I wear them with several of Kim Gravel's shirts and everyone always wants to know where I bought my outfit. Nice material. Does not show all your lumps and bumps. Need to wear long top with. Perfect fit. So comfortable and slimming and gives a great backside. 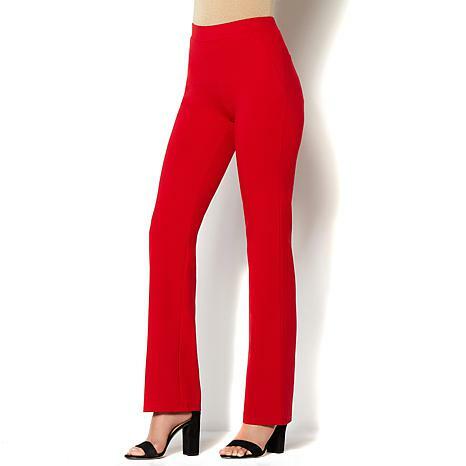 These ponte pants fit perfect and are very comfortable. They probably would not be a great length on a tall person. I'm 5'4" 132 pounds and they fit to my ankles. Ordered small. Went back and ordered another color because I liked them so well. Need to wear long top with. These slacks fit like a glove. The color is a rich blue and the fabrication is on point too. I got them on sale which is fabulous.Actually, I have several pairs of these pants. Stylish and comfortable. Nice Ponte fabric. Easy pull on and sleek bootcut. This pant runs true to size. Wear 12-14, large fits well.